The latest trends, products and offerings in the jewelry industry. 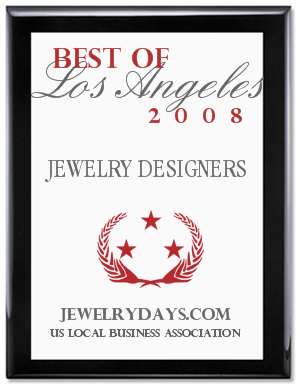 "Thanks for voting us the 2008 Best of Los Angeles Jewelry Designers"
WASHINGTON D.C., July 24, 2008 -- JewelryDays.com has been selected for the 2008 Best of Los Angeles Award in the Jewelry Designers category by the U.S. Local Business Association (USLBA). The USLBA "Best of Local Business" Award Program recognizes outstanding local businesses throughout the country. Each year, the USLBA identifies companies that they believe have achieved exceptional marketing success in their local community and business category. These are local companies that enhance the positive image of small business through service to their customers and community. Various sources of information were gathered and analyzed to choose the winners in each category. The 2008 USLBA Award Program focused on quality, not quantity. Winners are determined based on the information gathered both internally by the USLBA and data provided by third parties. U.S. Local Business Association (USLBA) is a Washington D.C. based organization funded by local businesses operating in towns, large and small, across America. The purpose of USLBA is to promote local business through public relations, marketing and advertising. The USLBA was established to recognize the best of local businesses in their community. Our organization works exclusively with local business owners, trade groups, professional associations, chambers of commerce and other business advertising and marketing groups. Our mission is to be an advocate for small and medium size businesses and business entrepreneurs across America.